Today’s guest is also the main admin of the Toronto Nanowrimo website, Errol–who is also already a winner with over 50, 000 words! Back in the day, I learned about NaNoWriMo from a Fan Fiction site. It was the most awesome challenge ever and even though I was horribly late, I signed up immediately. It changed how I did things. It changed how I approached creative projects. However I am not here to talk about that. I am here to tell you to grasp joy. Do you remember when you first heard about NaNoWriMo? Do you remember the trepidation, the elation, the first time experiences that brought about the determination to continue doing NaNoWriMo? Or are you going through it now? Debbie: Keep the faith, Tim! 99.999% of people who have started the submission process have been there. 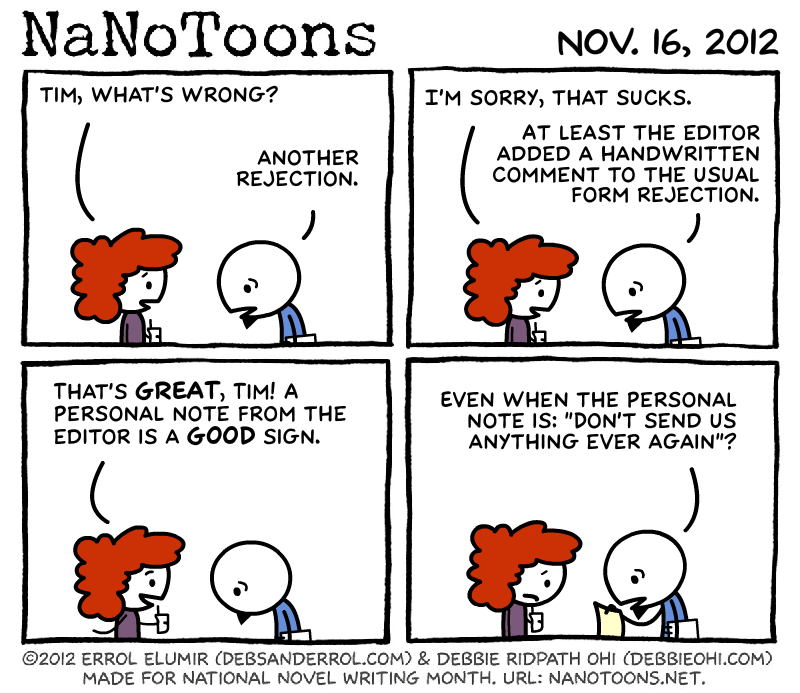 Rejection’s part of the job.